Purchasing high-quality components for car stereo is a good way of avoiding some common car stereo problems. However, any car stereo will sooner or later experience problems. There are about three major causes of car audio problems. Of course one is old age, and the problems thereof are inevitable. The second cause is components that do not match perfectly to enable production of high quality sound. The other cause, which happens to be quite common, is incorrect installation. When any of the above causes happens, many car audio problems can result. Some problems are related to the radio while others are speaker related. The lines below inform on the 7 most common car stereo problems and how to identify them. Solutions for each problem are provided in such a simple and understandable way that anyone without an engineering degree can apply them. Car radio fails to work properly when there is a problem in any of the power sources or in parts where current passes through. Wiring is one of the issues that might cause car radio to fail. The radio is connected to the power source and speakers through wires mostly found underneath the dashboard. If there’s a problem in the wiring, the radio will definitely not work. Secondly, car radios use fuses to prevent damage due to power upsurges. If the fuse is blown, the car’s audio circuit is broken and the radio cannot turn on. The other cause of car radio not working could be power or ground connector problem. Radio turns of at irregular intervals – there’s either a power or ground connection problem. Check whether the fuse is blown using a multimeter. First make sure that the system’s power is off, then having set your multimeter to ohms, touch the metal caps of the fuse with the multimeter’s testing leads and see whether or not a reading is recorded. If the multimeter shows a reading, the fuse is not blown; otherwise, no reading indicates that fuse is blown. Also check for wiring problems and issues with ground connections. If the ground connection is loose or rusted, it has to be fixed for the radio to work properly. If you find out that power cuts out in your recently installed aftermarket head unit, it’s highly likely that the head unit is not receiving 12V. Another cause for this head unit problem could be that your amplifier has switched into protection mode. There are two explanations for this. One, power produced by the alternator is too much for the amplifier and it has to protect itself from damage. Two, the battery is unable to provide the audio system with constant voltage. The most common symptom for this problem is the head unit cuts out and comes back after a while. Use a voltmeter to check if the power wire is sending 12V to the head unit. It the wire is doing so, then the problem’s with the head unit. But if you find out that the power wire is not sending 12V, it could be changed. Some fuses could also be blown and have to be replaced. Also check the battery; maybe the battery water needs to be refilled. This is a car stereo problem that usually occurs when factory speakers are being upgraded or aftermarket speakers are being installed or repaired. What can cause speakers to lack bass? For bass to be produced, speakers need to push air at the same time. The “no bass” problem occurs when one speaker pushes while the other pulls air. This mostly happens when the speakers are out of polarity. Another reason for the “no bass” scenario is that aftermarket speakers are heavier and harder than factory speakers. These speakers improve the quality of your car stereo but eat up the bass of your factory speakers. You don’t hear any bass at any volume level. How to solve the ‘no bass’ car stereo problem? Check whether the speaker wires are connected to the stereo amp and head unit appropriately. The positive (+) terminal of the speaker should be connected to the positive terminal of any other component, including the battery. Same case applies to the negative (-) terminal. Another potential solution is installing an external amplifier. Some people opt to have a head unit upgrade to solve the no bass problem. The bottom line is that your car stereo needs something that puts in more watts. Alternator whine: This is the most common car stereo noise. It often happens when ground for either the head unit or speaker’s amplifier is poorly chosen. 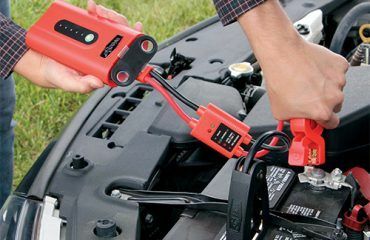 Poor condition of the charging system as well as connections between the audio system components and the battery can also result to alternator whine. Symptom of alternator whine: You hear a noise that fluctuates with the RPMs of your vehicle’s alternator. Alternator whine rises and falls with engine speed in a pretty annoying way. Accessory pop: This noise is normally associated with a particular electrical event. Usually, accessories like headlights, windshield wipers, turn signal and brakes draw high current and cause a voltage spike that then travels to the audio system. Symptom: A sharp pop sound is heard when you switch onor press high current car accessories like the ones listed above. Speaker popping and crackling: It’s often caused by breaking down due to old age or poor input quality or bad radio connection. Symptom: speaker crackles when the engine is turned on and when the car is in motion. For alternator whine, find the component that’s producing noise and re-grounding it. A clean, bare chassis metal is the ideal grounding. Also ensure that the charging system is in its best condition. All connections (battery posts, alternator connections, head unit, amplifiers, signal processors, and ground strap) should be secure. To eliminate noise due to accessory pops, add a small bi-polar capacitor between the power wire of the accessory producing noise and its ground. The capacitor will absorb the power surges thus preventing their transfer to the car’s audio system. If there’s speaker popping and crackling, swap the channel and check whether the noise will seize. Otherwise, crackling that happens all the time no matter what channel the radio is on means that the speaker is broken and has to be repaired or replaced. Sound cuts normally occur when the amplifier is getting overheating or a speaker wire has become loose. Amplifiers normally generate lots of heat especially when music is played at high volumes for long periods. To manage this amount of heat, the amplifier needs to be getting enough airflow. This problem is signified by sound from car speaker(s) suddenly cutting off and coming back after a short while. To solve this problem, ensure that there’s enough airflow where the amplifier is mounted. The airflow keeps the amp cool at all times and prevents sudden sound cut offs. Also check speaker wires to ensure that they are properly connected. Faulty wiring is the major cause of car stereo getting unusually hot. Speakers could be incorrectly wired, or wires that are supposed to run separately have been combined. There is no problem with the system getting warm since various electrical devices heat up while in use. However, generation of too much heat could be an indication of a malfunction. It is important to note that abnormal buildup of heat can be dangerous. The heat can damage various parts of the car stereo and even cause a fire. Symptom to check: The car stereo becomes too hot to touch when on. Solution: You probably need to check the entire installation and wiring of the car audio system. If there’s no installation or wiring faults and the stereo still runs hot, the ultimate solution might be servicing the entire system. The majority of non-equipment related audio problems result from poorly chosen ground points. Apart from alternator whine, poor grounding can cause the amplifier to clip. Poor grounding can cause the amp to cut in and out. When the car stereo is turned up, the amps pull more current. If the system has an unreliable ground the amp cannot pull the needed current. This normally sends the amp into clipping. Symptoms of poor grounding: Alternator whine; and the audio system produces crappy sounds. As you check the integrity of other connections, always remember that grounding is of utmost importance. If you install a large car audio system, it will require a bigger ground. Also important to remember is that grounds should be on the car’s chassis. Many people make a mistake of using the negative battery post as a ground for the car audio system. This is a terrible place as the entire ripple from various items including the alternator travels through this point. Using it a ground invites all the noise from these items into the sound system. The stereo is the main part of your car’s music system. Without it, your in-car entertainment is rarely enjoyable. For music lovers, especially, driving a car without stereo is unimaginable. The truth is that lack of proper maintenance can result to your car stereo showing the problems discussed above. To ensure your sound system is working the way it should, there’s need for a full diagnostic of the system. Installation faults as well as other causative issues will be addressed and the system will definitely run properly to give you the best sound quality. When you know how to identify and solve common car stereo problems, you can always take care of your car stereo and enjoy great music and hands-free calling in your car.